Princeton, New Jersey, at the turn of the twentieth century: a tranquil place to raise a family, a genteel town for genteel souls. But something dark and dangerous lurks at the edges of the town, corrupting and infecting its residents. Vampires and ghosts haunt the dreams of the innocent. A powerful curse besets the elite families of Princeton; their daughters begin disappearing. A young bride on the verge of the altar is seduced and abducted by a dangerously compelling man–a shape-shifting, vaguely European prince who might just be the devil, and who spreads his curse upon a richly deserving community of white Anglo-Saxon privilege. And in the Pine Barrens that border the town, a lush and terrifying underworld opens up. When the bride's brother sets out against all odds to find her, his path will cross those of Princeton's most formidable people, from Grover Cleveland, fresh out of his second term in the White House and retired to town for a quieter life, to soon-to-be commander in chief Woodrow Wilson, president of the university and a complex individual obsessed to the point of madness with his need to retain power; from the young Socialist idealist Upton Sinclair to his charismatic comrade Jack London, and the most famous writer of the era, Samuel Clemens/Mark Twain–all plagued by "accursed" visions. An utterly fresh work from Oates, The Accursed marks new territory for the masterful writer. 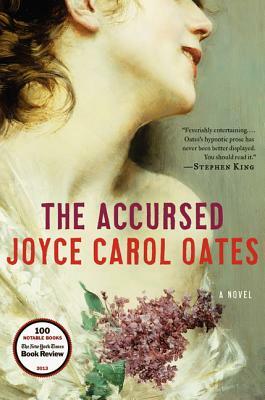 Narrated with her unmistakable psychological insight, it combines beautifully transporting historical detail with chilling supernatural elements to stunning effect.